Kohl's, Dillard's, and Nordstrom each surpassed analysts' EPS forecasts for the first quarter. Nevertheless, all three stocks crashed on Thursday. On Thursday morning, top U.S. department store chain Macy's (NYSE:M) reported a steep earnings-per-share decline for the first quarter, missing analysts' estimates by a wide margin. However, Macy's wasn't the only department store to reveal its first-quarter results on Thursday. Kohl's (NYSE:KSS), Dillard's (NYSE:DDS), and Nordstrom (NYSE:JWN) also released their earnings reports -- and all three beat analysts' EPS expectations. That didn't matter to investors, though. 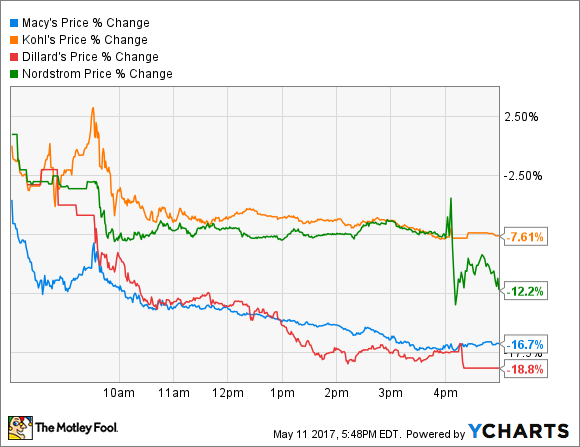 All four department store stocks were pummeled on Thursday, falling anywhere from 8% (Kohl's) to 18% (Dillard's). Department Stores Thursday Stock Performance. Data by YCharts. In the first quarter, sales fell 3.2% year over year at Kohl's, primarily due to a 2.7% decline in comparable-store sales. Nearly all of the sales pressure came in February, perhaps due to delays in the processing of tax refunds. According to Kohl's CEO Kevin Mansell, sales dipped just 1% in the March-April period, compared to an 8% drop in February. Cost cuts allowed Kohl's to post strong earnings growth last quarter. Image source: Kohl's. Despite the sales pressure, Kohl's adjusted EPS surged 26% year over year, reaching $0.39. This easily beat the average analyst estimate of $0.29. Solid cost control was a key driver of the strong earnings performance: Kohl's reduced its operating expenses by about 3% year over year. Gross margin also improved from 35.5% to 36.4% as the company did a better job of managing its inventory. Investors essentially ignored these cost savings and gross margin improvements at Kohl's, instead focusing on its sales decline, which was greater than expected. As a result, the stock fell about 8% during the day. Like most of its peers, Dillard's reported disappointing revenue results for the first quarter. Total revenue declined 5.6% year over year to $1.45 billion on a 4% comp sales decline, missing the average analyst estimate of $1.47 billion. On the bright side, gross margin from Dillard's retail operations increased by 65 basis points (0.65 percentage points) year over year. Additionally, Dillard's share buyback program led to a roughly 12% decrease in the company's diluted share count. As a result, EPS fell just 2% year over year to $2.12, ahead of the average analyst estimate of $2.02. While these results weren't spectacular, they weren't terrible, either. Nevertheless, investors dumped Dillard's stock on Thursday, causing it to plunge nearly 18%. Lastly, Nordstrom reported solid first-quarter earnings results after the market closed on Thursday afternoon. Revenue increased 3.2% despite a 0.8% comp sales slump, because Nordstrom continues to open new stores, particularly for its Nordstrom Rack off-price chain. The total revenue figure was roughly in line with analysts' estimates, although many investors had hoped for stronger comp sales results. Meanwhile, Nordstrom's adjusted EPS soared 19% to $0.43, far ahead of the average analyst estimate of just $0.27. Higher credit card income was the main driver of this earnings growth. Nordstrom reported modest revenue growth for the first quarter. Image source: Nordstrom. Nordstrom is by far the best-positioned department store chain today, precisely because of its efforts to diversify away from its full-line mall-based stores. Investors weren't satisfied, though. Nordstrom shares plunged nearly 8% during the day on Thursday -- before the earnings release -- and then fell another 4% after hours. The 17% sell-off at Macy's on Thursday seems like an overreaction, but at least investors' ire could be explained by Macy's sharp earnings decline. By contrast, while the first-quarter earnings reports from Kohl's, Dillard's, and Nordstrom made it clear that department stores are still under pressure, all three chains posted solid earnings results -- including big EPS increases at Kohl's and Nordstrom. Thus, Thursday's sell-off could make this a good time to pick up department store stocks at a steep discount. Shares of Kohl's, Dillard's, and Nordstrom are cheap compared to the broader market. Moreover, all three have shown a remarkable ability to keep earnings afloat despite the challenging sales trends affecting the department store industry.